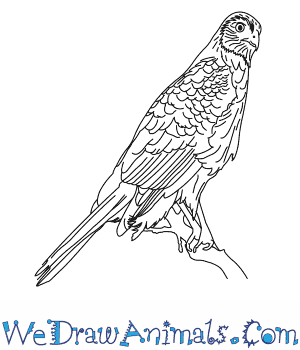 In this quick tutorial you'll learn how to draw a Coopers Hawk in 9 easy steps - great for kids and novice artists. At the bottom you can read some interesting facts about the Coopers Hawk. Step 1: Start with a small curved shape for the head of the Cooper Hawk. Step 2: Draw the face by adding a round eye and pupil. 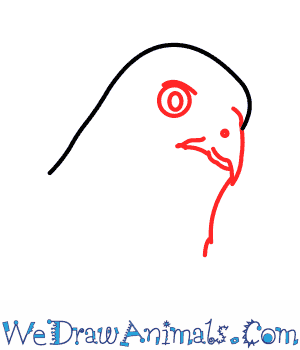 Add a triangle shape for the beak, and then a small curved line downward for the neck. 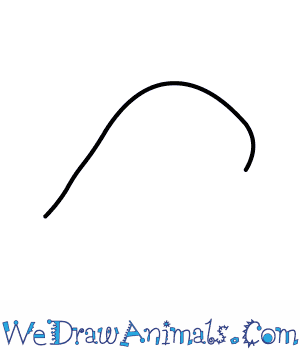 Step 3: To draw the body, draw a smooth line down the back. 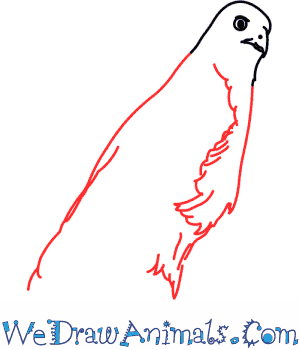 For the front, start drawing some feathers like show in the picture. Make sure to leave plenty of open space for the wings, tail, and feet. Step 4: Now, on to the wings. Draw several lines straight down and make sure to have them rounded out at the bottom. Cooper Hawks have rounded wing tips. 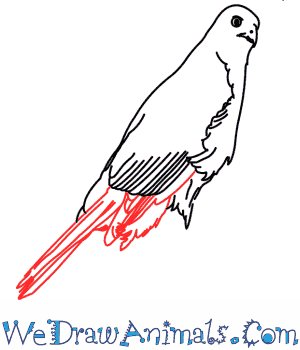 Step 5: To draw the tail, add lines similar to the wings, but make them a bit longer. Keep them rounded at the tip as well. 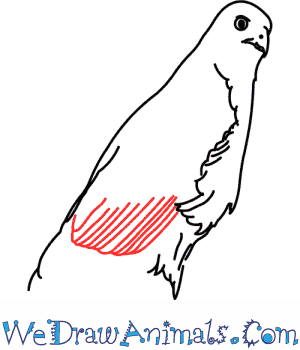 Step 6: Add the front leg by drawing a small cone shape with small talons at the end. Step 7: Draw the second leg behind the first, also including the talons. 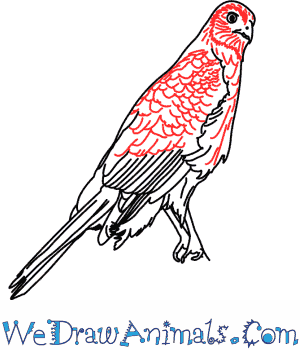 Step 8: Now add the details of the pattern on the Cooper Hawk. 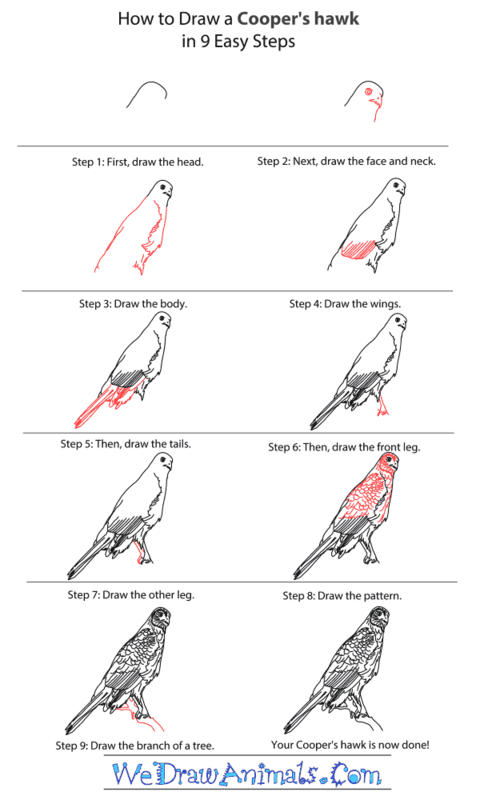 Add many small curves all over the head and body for the feathers, too! A Cooper’s Hawk is one of the most common hawks in North America. They live where there are lots of trees and lots of small birds to eat. Bird watchers often report Cooper Hawks as the main hunter of the prettier birds they see at their feeders. A normal adult size Cooper’s Hawk is 14 to 18 inches long. 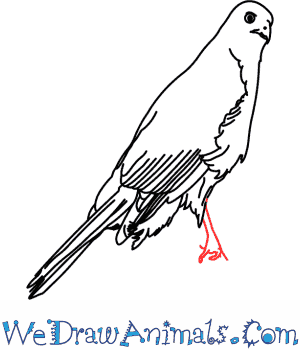 Its wingspan ranges from 24 to 37 inches and the tips of the wings are rounded. During breeding season the Cooper’s Hawks will pair up and spend around two weeks preparing a nest for their eggs. The female will sit on the eggs for 30 to 36 days. When the eggs hatch there will be a two week feeding stage where mom feeds the chicks the food that dad brought back. After a month the chicks will leave the nest, but come back for meal time. 8 weeks after that, they are totally independent and finding food on their own. A Cooper’s Hawk will have one mate per season. This doesn’t mean they will mate for life, the next year they find a new mate. Cooper Hawks are commonly mistaken for Sharp-Skinned Hawks. Although seeing the difference can be tricky, it is seen mostly in the size and feathers. Cooper Hawks are bigger than Sharp-Skinned Hawks. Their chests are similar in color, but the Cooper Hawks feathers look more like spots and the Sharp-Skinned is like stripes. Even though any hawk will most likely eat smaller birds first; they will also eat small mammals like chipmunks, squirrels, mice, rabbits, and sometimes lizards. Most people are bothered by the fact that a Cooper Hawk will camp out near a bird feeder waiting for prey. A piece of advice for concerned bird watchers is to take the feeder down for a few days so that the smaller birds aren’t baited. When there isn’t as much traffic coming and going, then the hawk will move on to other hunting grounds. The oldest known living Cooper’s Hawk was 20 years old. The normal age for one is 12 years. Activity: A good way to get your students exercise is a simple game of tag. Take the children outside and draw straws or color tipped craft feathers for the first person to be it. Monitor for good sportsmanship.